This is one of the courses this reporter looks forward to playing every year, and I suspect it's pretty much the same for most of the golfers who come back year after year asking the same question. Why there is not a permanent 18 baskets in this stunning park beats me. 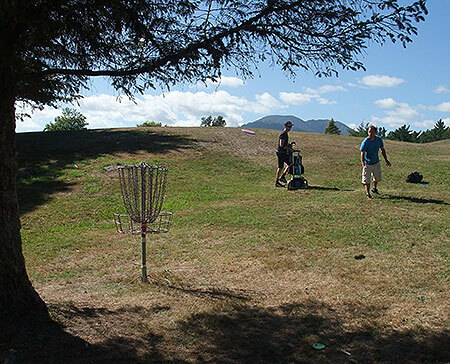 One look at the amount of people who play the Queenstown Gardens is indication enough that a large percentage of the day long trail of togged and towelled people heading to and from the natural thermal spring at the bottom of the course would enjoy a round of Disc Golf. Not to mention be a great addition for locals to get into as well. Fingers crossed that in the not too distant future it won't be a once a year visit where we have to cart baskets out and in. In the mean time it's certainly worth the effort ... so thanks to everyone who travelled with baskets to make this happen. It's also great to now have a date in 'March' to visit this stunning part of the country. 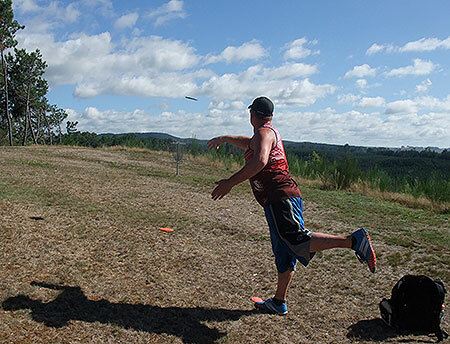 Blue skies and sunshine make a big difference to your level of Disc Golf enjoyment ... and that's exactly what we had over the entire weekend. 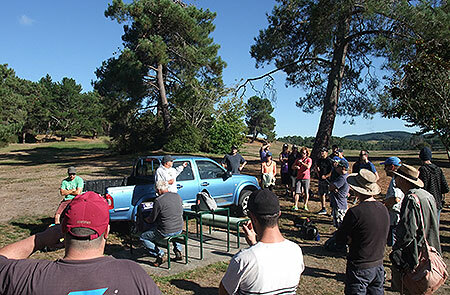 With so many events on the NZDG tour now players are having to decide which events they can or can't play so it was great to have 44 players come the close off of registration on the Saturday morning, including a bunch of first time tour event players. It was also excellent to see that most of those had 'pre-registered' which has got to help out the TD immensely. With a per of 56 any round under you've got to feel good about on this Spa Park course so it was a treat to see the scores that came in after the opening round on the Saturday morning, 10 players with sub-par rounds. 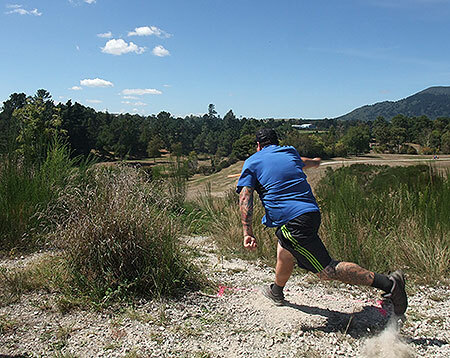 Recently returned to NZ, now residing in Northland, Mario Cerniar was the best of them on a 50, Jacko Sullivan and the evergreen Simon Feasey a shot back on 51's with a U.S. now Gore based player Zack Horrell on a 52. They would make up the top card for the afternoon round. It seems nerves got to most in the afternoon - bar Jacko Sullivan who was the only one of the top card to improve on his score coming in with a sublime 49. Going into the final full round on the Sunday morning Jacko had a 4 shot advantage over Simon and Mario with Zack another 2 back. Gemma Sullivan had a grip on the Woman's field but this was Spa Park and anything could happen. Simon threw a blinder which included a stunning 80 metre Eagle on hole #5 coming in with a course record 46 [10 under the card] but he'd only managed to close the gap on Jacko to 2 shots going into the safari 'Super 6'. TD Bob Gentil had come up with a testing safari 'Super 6' which made the most of the distance and elevations available in the awesome park. 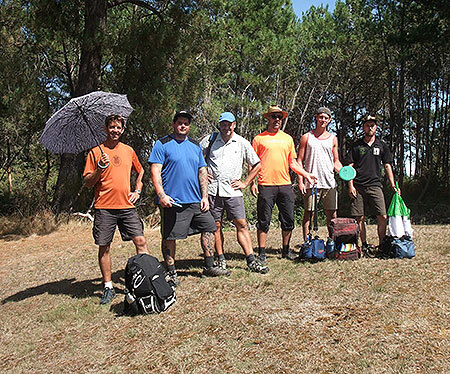 Rotorua Disc Golfer Logan Papuni along with German touring player Moe Doerken joined the Super 6 for what was a stunning display of our sport at its best. Congratulations to everyone who took part over the weekend, well done to the winners; Jackson Sullivan Open, Mario CerniarMasters, Douglas Macilroy GM's, Gemma Sullivan Woman's, Robyn Agnew WGM, Rowan Bezuidenhout Open Rookie and Tamati Payne J10 Junior. Get ready to spa! - Blue sky and sunshine greeted the players at Saturday morning's players meeting. Making the Split - Watch where ya stand! Steve Fargher putts out #3 from a precarious position. 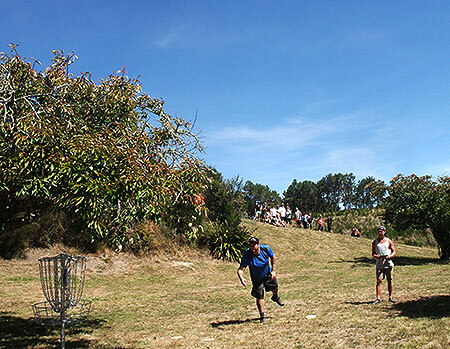 Hutt Putt - Upper Hutt golfer Ryan Kitto waited till the final round to find his form. Character in Shade = Shady Character- The Lost Tribe's Pete Boyle played consistent golf all weekend but was pipped for the GM's title by 1 on the last round. KABOOM! - Jacko Sullivan maintaining his grip on the field as he powers his way of the elevated 'Super 6' Tee 4. It's a Jacko-Up! - Jacko had set his mind on winning this event and nobody was going to stop him. Winners are Grinners - Congratulations. 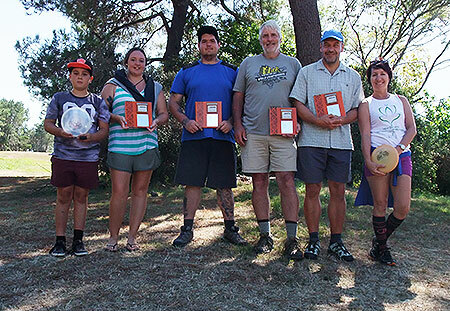 The '2016 www.discgolf.co.nz Taupo Classic' winners. Tamati Payne, Gemma Sullivan, Jacko Sullivan, Douglas Macilroy, Mario Cerniar and Robyn Agnew. Well Structured - Wellington builder Steve Fargher hoping to open his weekend's account with a birdie. 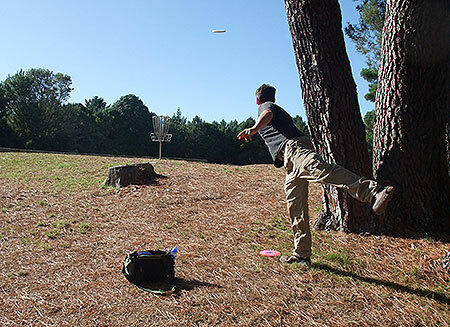 Tippie Toes - Disc Golf ballet. Eventual woman's winner Gemma Sullivan delicately approaches basket 13. 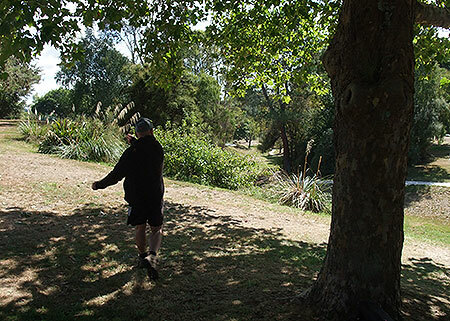 It's All Downhill From Here - Tauranga Disc Golfer Paul Gosling on his way to a solid 4th finish in Masters. Pretty Parasol - The 2016 Taupo Classic 'Super 6'. Simon Feasey, Jackson Sullivan, Mario Cerniar, Mo Doerken, Zack Horrell and Logan Papuni. 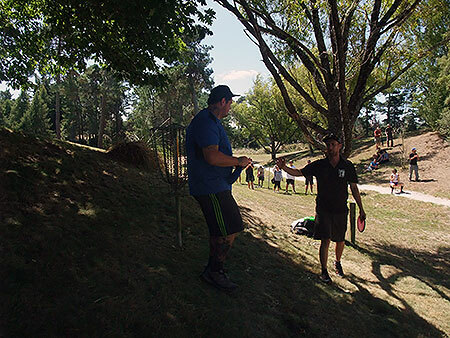 "'ll Just Chuck It Over There" - The gallery check out Mario Cerniar's style on hole 4 of the 'Super 6'. You Da Man! - Logan Papuni offers congratulations to Jacko Sullivan after he laid up for a safe putt on the final 'Super 6' hole to take the 2016 title. "How hard can it be" - The GM lays down the rules. 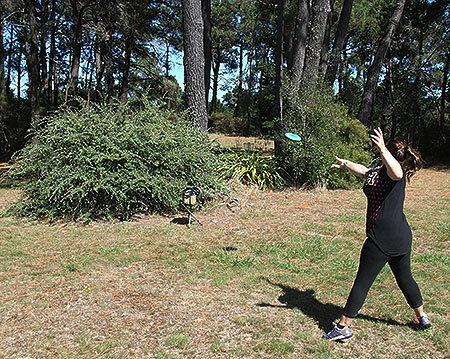 Disc Golf Training, Clench Those Glutes! - Could have been nasty but GM Douglas Macilroy finds the chains with his 12 metre downhill putt on 11. 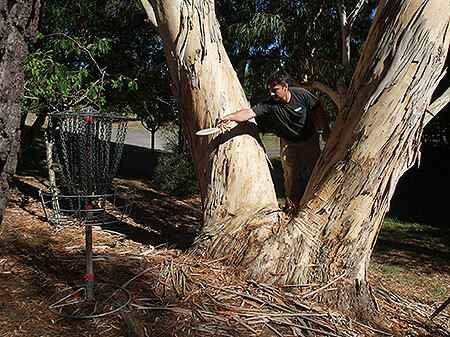 Rust Never Sleeps - Basket 4 on the hole aptly named 'Don't be scared' caused a few problems for golfers, but Ryan Kitto wasn't one to gamble. Leftie Lob - Speedo Keene had a spot of putting troubles on the Sunday morning and it didn't help when his caddy turned up late with a sore head. 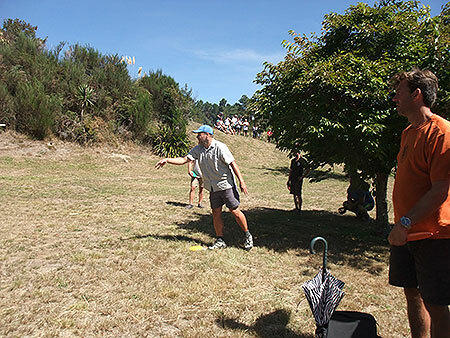 European Flair - Swiss / Northland's Mario Cerniar putts out 'Super 6' hole 2 as the gallery add some pressure. Gore Blimey! - "Who the hell is Zack Horrell?" Great to have a top performer from Gore. Champ to Champ, the Orange Twins - Simon Feasey watched Moe Doerken putt out hole 5 of the 'Super 6'.